Adams Tower West is a student dormitory occupying one of the two towers, formerly known as The New England Center, that had previously housed a hotel, conference center, and restaurant. 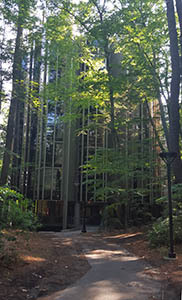 Designed by William L. Pereira Associates of Los Angeles, the New England Center originally opened in October 1969 with an addition of 61 rooms and three conference rooms, designed by Architects Collaborative, Inc. and J.S.A., Inc., completed in July 1988. First dedicated on January 10, 1970, the New England Center for Continuing Education was a cooperative initiative of the six state universities in New England, the State of New Hampshire, the U.S. Office of Education, and the W.K. Kellogg Foundation, as well as private donations. In 2010, financial concerns forced the closure of the hotel, conference center, and restaurant. The conversion of one of the towers to student housing preserved an architectural landmark, named to honor Arthur Stanton Adams, the eleventh president of the University of New Hampshire (1948-1950), who left the university to become president of the American Council on Education, but later to return as a consultant on the establishment of the New England Center. Dedicated on October 20, 1951 as a dormitory for men, Alexander Hall is named for Dr. Norman Alexander. He came to the University of New Hampshire in 1923 as an economics instructor and served on the university’s faculty until his death in 1950. During that time, he was promoted to the chairmanship of the Department of Government in 1944 and served as the Dean of Men from 1929-1944. Dedicated on March 16, 1968, Babcock Hall was named in honor of Donald C. Babcock, a former Professor Emeritus of Philosophy. He arrived on campus to join the faculty of New Hampshire College in 1918, serving in numerous capacities – including assistant professor, professor, and departmental chair – until his retirement from the University in 1956. During the Second World War, Babcock’s area of focus shifted from history to philosophy, so he served as the chairman and sole member of the Philosophy Department from 1944-1955. He was subsequently awarded an honorary Doctor of Humane Laws degree in 1960. 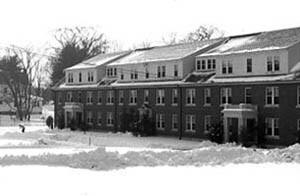 The building, designed by Carter & Woodruff and built by Davison Construction Company, was the first student residence designed specifically to house graduate students and was first designated as Babcock House in an effort to convey its status as a combination residence and graduate studies center. 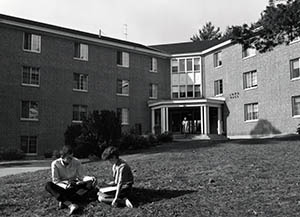 The first residents moved in January 29, 1968. Presumably named for one of Durham’s early leading families, Ballard Hall was built by Albert DeMeritt in 1894 on the corner of Ballard Street and Garrison Avenue. 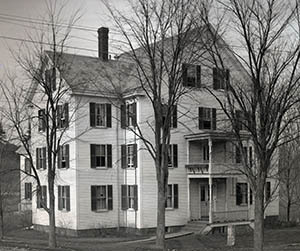 It was used as a private rooming house by male students until 1899, when it was leased by the bachelors of the College’s faculty and called the “Durham Club.” The building was subsequently leased by New Hampshire College in 1914 to use as a fraternity house. It was then remodeled for use as a dormitory and later housed the Music and Art departments, The New Hampshire and The Granite headquarters, and a chapel. In 1942, a pottery laboratory was installed in the building. Ballard Hall was demolished in 1961 to make way for Stoke Hall. 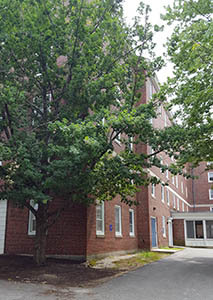 Dedicated September 19, 1970, Christensen Hall is named for Ernest W. Christensen, a longstanding member of the University of New Hampshire community. He began is studies at New Hampshire College in 1916, but took a leave of absence to serve in the Armed Forces during World War I. He returned to New Hampshire College in 1919 and completed his program of study in 1923. After graduating, Christensen became assistant football coach from 1923-1925, before accepting a full time coaching position in both hockey and lacrosse for the next eleven years. He served on the Board of Trustees from 1940-1961 and received an honorary Doctor of Laws degree in 1962. 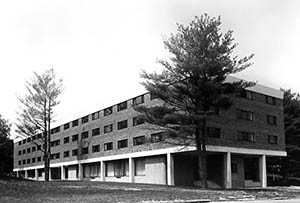 Designed by Ulrich Franzen & Associates and built by Harvey Construction Company, Christensen was the second “high-rise” residence constructed on the University of New Hampshire campus. It was the first hall to contain apartments for a faculty member in residence with the intent of fostering student-faculty collaboration outside of the classroom. 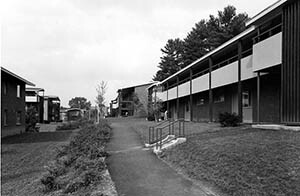 The dorm was completed in late 1969, but had opened its doors to residents that September. 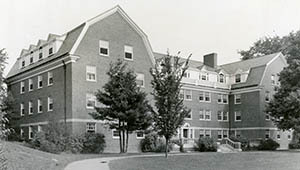 Designed by Professor Eric T. Huddleston, Congreve Hall was constructed in 1920 as the second women’s dormitory on campus. Funds for the building were borrowed from the Alice Hamilton Smith Fund, established by the will of Alice Hamilton Smith and providing that half of her estate should be granted to New Hampshire College upon the death of her daughter. The loan was repaid through the residents’ rents. The building’s center section was added in 1922 and another wing was dedicated October 1, 1938. Congreve Hall is named in honor of Alice Hamilton Smith’s first husband, Charles Mcilvaine Congreve (1829-1878). Though born in England, Congreve was raised in Brooklyn, New York as part of a family that made its fortune in the metal and hardware business. He was a descendant of the creator of Congreve rockets, a popular nineteenth century military weapon. Congreve married Alice Jennings in 1873 and the pair had a daughter, Edith, before Congreve's death five years later. 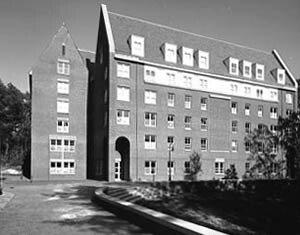 Dedicated as a residence for women on October 22, 1966, Devine Hall is named for Maurice F. Devine, a long-standing University trustee. Devine was a lawyer, with an extensive résumé including: drafting the 1944 GI Bill of Rights, serving as president of the New Hampshire Bar Association and the State Judicial Council, and completing a fellowship of the College of Trial Lawyers. He was also the director of New Hampshire Catholic Charities, named to the Order of St. Gregory by Pope John Paul VI in 1965. Devine served on the University’s Board of Trustees for two decades, beginning in 1949, also serving as senior trustee and chairman of the Board’s Finance Committee. Devine Hall was designed by Irving W. Hersey Associates and built by Davison Construction Company. It was designed to be handicap-accessible and is linked to the two earlier buildings of the Upper Quad, Randall and Hitchcock Halls. 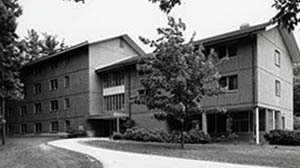 Eaton House was dedicated on October 17, 1976 as a residence and learning community for students interested in the creative arts. It is named for Forrest M. Eaton, a graduate of the Class of 1926 and a trustee and chairman of the University’s Board of Trustees, serving 1959-1967. Eaton also completed two terms as president of the University's Alumni Association. Dedicated June 14, 1947, Engelhardt Hall is named for Fred Engelhardt, president of the University of New Hampshire from 1937-1944. A veteran of the First World War, Engelhardt came to UNH after a long career in public and higher education. During his tenure at UNH, he was responsible for the expansion of General Extension services, the construction of Pettee Hall, the completion of the Field House and grounds, and the expansion and renovation of Hamilton-Smith, New Hampshire, and Nesmith Halls. Dedicated April 12, 1916, Fairchild Hall is named for Dr. Edward T. Fairchild (1854-1917), who served as president of New Hampshire College from 1912 to his death in 1917. A former state superintendent of public instruction in Kansas and president of the National Education Association, Fairchild’s tenure at the College ushered in great change. During that time, three dormitories and DeMeritt Hall were constructed, enrollment nearly doubled, the Departments of Home Economics and Industrial Mechanics and Electricity were added, and entrance requirements to the College were updated and revised. Fairchild Hall was completely renovated in 2008 and began housing international students in 2010. Construction on the Forest Park Apartments began in 1961 to replace the former College Road Apartments, which had been deemed too hazardous for continued occupation. 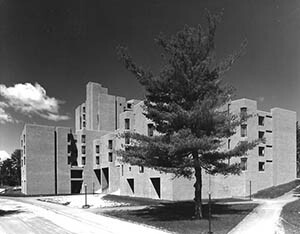 The apartments, originally totaling 98 units, were completed in 1968 to accommodate married faculty members and students enrolled at the University. 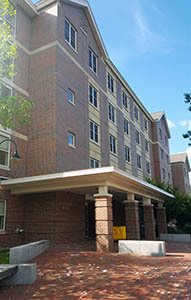 The Gables are comprised of three towers made up of four-to-six person apartments that house a total of 584 students. The complex also includes a community building for residents to use for study and recreation. 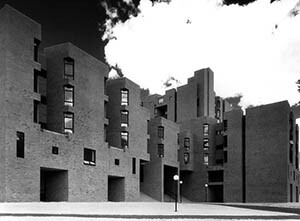 The apartments were designed by Sasaki Associates and built by Suffolk Construction between June 1990 and August 1991. 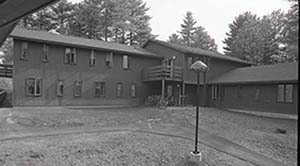 The Gables were dedicated on October 17, 1991 during the annual meeting of the University System of New Hampshire's Board of Trustees. Dedicated June 14, 1947, Gibbs Hall is named for William D. Gibbs, president of New Hampshire College from 1903 to 1912. Given his background in agricultural education, he was given a warm reception from Durham agriculturalists, who had not favored the policies and priorities of his predecessor, President Murkland. Gibbs is remembered for his commitment to better serving the educational needs of the entire state by broadening the scope of the College as an institution of higher learning. Built in 2008 and formerly known as SERC C, Haaland Hall was renamed on October 11, 2013 in honor of Gordon A. Haaland, president of the University of New Hampshire from 1983-1990. Haaland first arrived at UNH in 1965 as a psychology instructor and was promoted to assistant professor within a year. After receiving a doctorate in social psychology from the State University of New York at Buffalo in 1966, he was named an associate professor at UNH in 1969, a full professor in 1974, and served as department chair from 1970-1974. Haaland left the University in 1975 to serve as the Dean of the College of Arts and Sciences at the University of Maine at Orono. He returned to UNH in 1979 to serve as vice-president for academic affairs, interim president, and president. He left the University once more in 1990 to assume the presidency of Gettysburg College. Dedicated October 17, 1976 as a residence for students desiring quiet study housing, Hall House is named for Fred W. Hall, Jr. A graduate of the class of 1941, Hall went on to serve as a trustee and chairman of the University’s Board of Trustees 1967-1973, in which role he helped to support and defend the freedom of higher education. Hall also served as a member on the Governor’s Council, the president of the New Hampshire Bar Association, and the chairman of the State Management System Committee of the New Hampshire Citizens Task Force to study state government. Hall House now hosts a community of students interested in outdoor recreation. 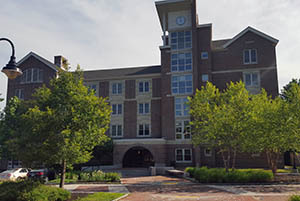 Built in 2007 as SERC A, Handler Hall was renamed in honor of former University president Evelyn Erika Handler (1933-2011) on October 11, 2013. Originally from Hungary, Handler’s family fled the Nazi regime, settling in New York in 1940. She received her education at Hunter College of the City University of New York and was considered an expert in the field of myelogenous leukemia. When she began her term as UNH president in 1980, Handler became not only the University’s first female president, but the first female president of any land and sea grant university. During her tenure, she was committed to maintaining low tuition rates and made plans for the construction of Morse Hall. She departed UNH in 1983 to serve as president of Brandeis University and died in a car accident in 2011. Built in 1925, Hetzel Hall was dedicated in honor of Ralph Dorn Hetzel (1882-1947) in June 1927. Hetzel came to New Hampshire College from Oregon Agricultural College in 1917 to serve as trustee and president for the next decade. During his time at the University, both student and faculty populations doubled, the legislature designated the institution as a university, and he secured the passage of the “millage law” to ensure the state’s continued financial support for the University. Hetzel left UNH in 1927 to become president of Pennsylvania State College. Hitchcock Hall was designed by Irving W. Hersey Associates and built by Blanchard Stebbins, Inc. Completed and occupied in the fall of 1959 as a men’s dorm, Hitchcock Hall was dedicated April 24, 1960 in honor of Leon Whitney Hitchcock. Born in 1886, Hitchcock came to New Hampshire College in 1910 and taught electrical engineering as an assistant professor, associate professor, professor, and department head until his retirement in 1956. During his tenure at the University, Hitchcock served under nine of the institution’s 13 presidents up to that time. He was chairman of department for 31 years and saw his department grow from two men to 12. During World War II, he served as acting dean of the College of Technology. 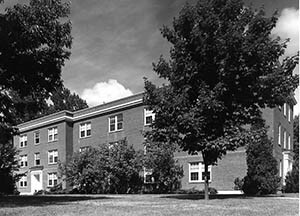 Dedicated March 16, 1968 as a hall for female residents, Hubbard Hall is named in honor of Austin I. Hubbard. A 1925 graduate of the forestry program at the University, Hubbard was named to the Board of Trustees in 1944 and served in turn as its secretary, vice president, and president. He was awarded the Alumni Meritorious Service Award in 1954 and an honorary Doctor of Laws degree in 1963. He retired from the Board of Trustees after 17 years and later served on the advisory board for the Whittemore School of Business and Economics. Hubbard Hall was designed by Griswold, Boyden, Wylde & Ames and built by Franchi Brothers Construction Company. Dedicated June 14, 1947, Hunter Hall is named for Roy Deneale Hunter (1873-1944). Hunter was a member of the Board of Trustees for more than 28 years and served as its president for 13 years. He also served as chief executive officer of the University twice in the wake of the deaths of President Lewis in 1936 and President Engelhardt in 1944. His service was recognized with an honorary Doctor of Laws in 1937. Hunter’s dedication to UNH is evident in that his last public action before his death was to attend a trustees’ meeting. 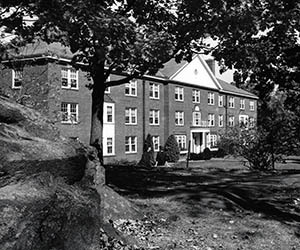 Opened in September 1963 as a residence for female students, Jessie Doe Hall was dedicated May 9, 1964. Jessie Doe (1887-1943) was the daughter of a New Hampshire Supreme Court Chief Justice and a champion of women’s equality. An avid traveler and mountain climber, she was the first woman to serve in the New Hampshire legislature and was also a member of the UNH Board of Trustees from 1934-1943. 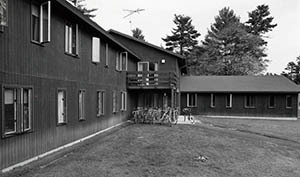 The dormitory was designed by Maurice E. Witmer, A.I.A. and contracted by Bond Bros., Inc. Dedicated April 24, 1960, Lord Hall is named for Frank Stetson Lord (1858-1937). A former schoolteacher and educational board member in Ossipee, New Hampshire, Lord found success later in life in both real estate and lumber manufacturing. He was also a Carroll County commissioner, a senator of the New Hampshire General Court, director of the North Conway Loan and Banking Company and the Carroll County Trust Company and a member of both the Odd Fellows and Masons. Although he had no direct connection with the University of New Hampshire during his lifetime, Lord left a bequest to the University to establish an educational trust fund. When the gift was presented in 1951, it was valued at $250,000, making it the second largest donation to the University at that time (after that of Benjamin Thompson). Lord Hall was designed by Koehler and Isaak and constructed in 1957-1958. It was first occupied as a women’s dorm during the spring 1959 semester. 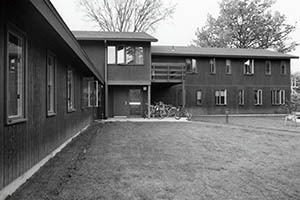 Marston House was dedicated on October 17, 1976 as a residence for students able to speak French, Spanish, or German with the obligation that residents would speak only the language of their assigned wing. 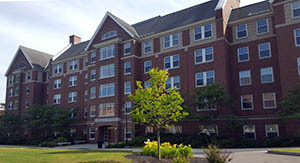 The dorm is named for Philip M. Marston, a 1925 graduate of the University of New Hampshire. He joined the faculty a year later, receiving a Master of Arts in 1927. He went on to become chairman of the history department, as well as official University Historian. Marston was instrumental in the research and writing of the university history compiled for the University’s 75th anniversary and developed materials for Dean Everett Sackett’s 1974 history of the University before retiring in 1966. 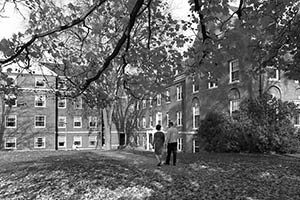 Dedicated March 19, 1955, McLaughlin Hall is named for Helen Fitch McLaughlin, who served the UNH community for 36 years. McLaughlin first came to New Hampshire College as a home demonstration agent in 1917 before becoming chair of the home economics department in 1920. A charter member of the American Association of University Women in the region and active in the establishment of Phi Upsilon Omicron on campus, she held the rank of Professor Emerita from her retirement in June 1953 until her death in 1954. 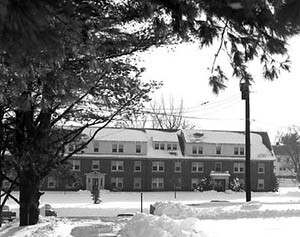 Dedicated November 7, 2002, Mills Hall, or “The Mills,” is named for former UNH President Eugene Mills. Mills joined the University as professor and chairman of the Department of Psychology in 1962. He was named dean of the graduate school the following year and dean of the College of Liberal Arts in 1967. In 1970, he was promoted to the post of academic vice president, which he held until he became acting president in July 1974. Mills subsequently served as president from 1975-1979, when he resigned to become president of Whittier College, a small Quaker liberal arts school in California. Formerly known as SERC B, Peterson Hall opened in 2007. On October 11, 2013, SERC B was renamed to honor Walter R. Peterson, who had passed away in 2011. Peterson had come to the University of New Hampshire as an undergraduate in 1942, before leaving to join the Navy during the Second World War. Although he finished his degree at Dartmouth College following the war, he was awarded an honorary degree from UNH in 1969. He went on to serve in the New Hampshire legislature as speaker of the House and was later elected governor from 1969-1973. From 1995-1996, he served as interim president of UNH, between the administrations of Dale Nitzschke and Joan Lietzel. Dedicated April 24, 1960, Randall Hall is named for Frank Wiggin Randall, a 1907 graduate of the electrical engineering program at New Hampshire College. He went on to have a distinguished career in gas and electric, eventually becoming the president of the New England Gas and Electric Service Corporation. At the time of the building’s dedication, Randall had been serving on the Board of Trustees for 24 years, including a four year stint as secretary and 10 years as its president. He had also briefly served as the University’s interim president and as president of the Alumni Association. In recognition of his dedication to the University, Randall received the Alumni Association’s Meritorious Service Medal in 1936, an honorary Doctor of Laws degree in 1948, and the Pettee Memorial Medal in 1957. 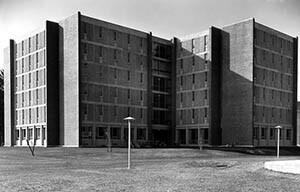 Randall Hall was built in conjunction with Hitchcock Hall by Irving W. Hersey Associates and Blanchard Stebbins, Inc. Construction began in 1958 and concluded August 1959 in time for occupation during the fall 1959 semester. Dedicated October 17, 1976 as a residence for those interested in outdoor recreation, Richardson House is named for Edythe T. Richardson. Richardson received a bachelor of science from New Hampshire College in 1922 and a master of science from the University of New Hampshire in 1924, the same year she joined the faculty. She served as a professor of zoology until 1966. Richardson House is now home to the First Year Experience. Dedicated October 17, Sackett House was named for Everett B. Sackett, a faculty member, college dean, and administrator. During his tenure at UNH, spanning from 1938-1968, Sackett served as professor and chairman of the education department, dean of students and of the College of Liberal Arts, associate registrar, registrar, and director of admissions. He was also the former university historian and author of New Hampshire’s University, published in 1974. Originally one of the “Mini Dorms,” Sackett House was razed in 2007 to make way for the construction of the SERCs. 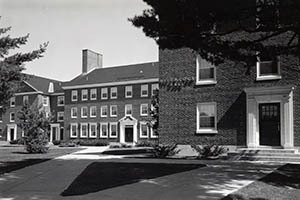 Dedicated October 20, 1951 as a dormitory for women, Sawyer Hall is named for Elizabeth Coffin Sawyer, the first female member of the Board of Trustees serving 1925-1932. She was awarded an honorary Master of Arts in 1947 for “her qualities of character, integrity, and understanding” (Program from the Dedication of Alexander Hall and Sawyer Hall). 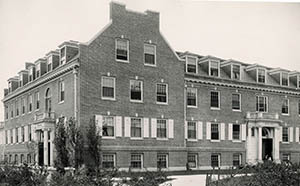 The construction of Scott Hall was completed in 1932. The dormitory is named for Dr. Clarence Watkins Scott, a former history teacher at the University from 1879-1930. He helped establish New Hampshire College with Dean Pettee after its removal from Hanover to Durham. Standing at 83 feet tall, Stoke Hall was the University’s first “high-rise” structure. 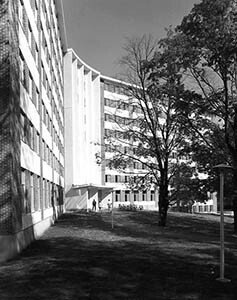 The two wings facing Garrison Avenue were constructed in 1965 with the third wing following in 1966. Designed by Leo Provost and built by the Davison Construction Company, it stands on the site of the former Ballard Hall. Dedicated on November 16-17, 1966 as a residence for men, Stoke Hall is named for Dr. Harold Walter Stoke, President of the University of New Hampshire from 1944-1947 during an enrollment surge that more than tripled enrollment and the beginning of a massive building program that continued for decades. Stoke held teaching and administrative posts at a number of institutions across the country before coming to UNH and held the presidencies of Louisiana State and Queens College in the years following his time at UNH. Throughout his career, he was awarded honorary degrees from Tulane and the Universities of Maine, New Mexico, and New Hampshire. Williamson Hall was dedicated June 10, 1972 and named in honor of Dean P. Williamson, a graduate of the class of 1932. He was awarded the Alumni Meritorious Service Award in 1956 for his dedication to his alma mater and later served as the alumni-elected Dean to the Board of Trustees for eight years, two of which as chairman. In addition, he served as president of the National Association of Governing Boards of Universities and Colleges. Each year, the University also bestows the Dean Williamson Award "to that senior who has been outstanding and well-rounded in extracurricular activities, scholarship, athletics, and loyalty to the University." 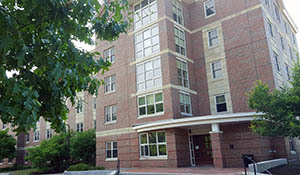 The Woodside Apartments opened in fall 1983 as the first undergraduate apartment complex on campus. It was known as the Undergraduate Apartment Complex until the early 1990s, when a contest was held to decide on a cleverer name for the complex. The winning entry came from a student and has stood the test of time. 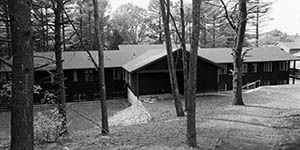 Dedicated October 17, 1976 as an environmental house for residents concerned with the conservation of natural resources, Woodruff House was named for Ruth J. Woodruff, a faculty member, professor of economics, and Dean of Women whose university career spanned 1932-1967. The building was razed in 2007 to make way for the construction of the SERCs.